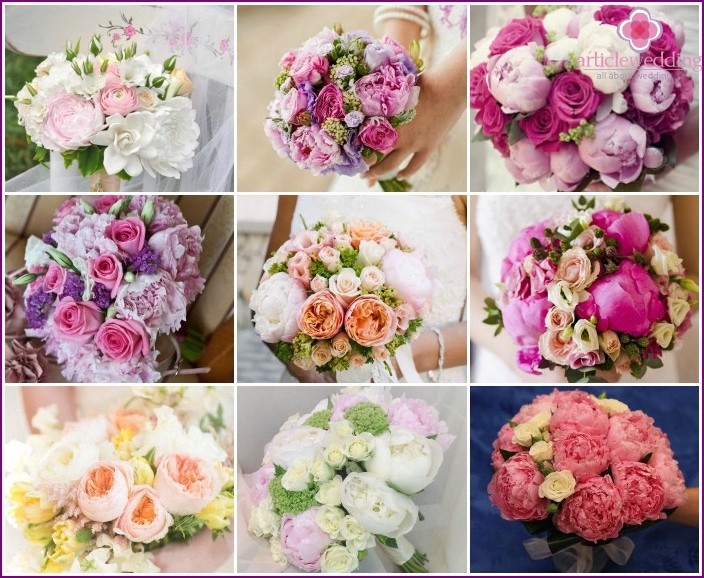 Wedding bouquet - an indispensable attribute for the bridein the wedding day. Beautifully composed composition is able to complement the image, to convey the mood and emotions of the future spouses. daisies, lilies, roses, orchids - any colors can be used to create the attribute. Their choice is primarily dependent on the wishes of the bride and the style in which formalized a wedding. 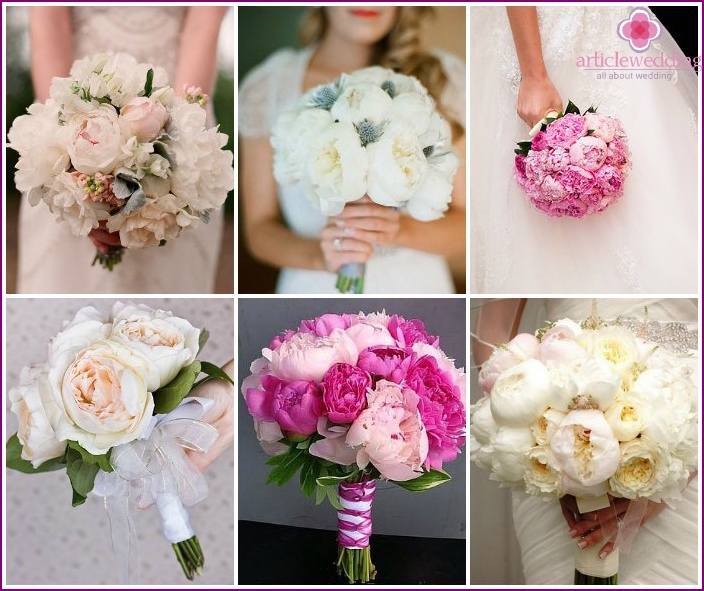 And lately especially popular bridal bouquet of peonies. He looks gentle, elegant, and beautiful colors and shades can make it unique, in a special holiday. Bouquet only recently came out of pions infashion, but quickly won the hearts of young girls. Until recently, these flowers were considered too simple and unobtrusive to use them for decoration of the wedding. But some brides were able to see their beauty and charm, especially they like their stunning, pleasant scent that smells all day long. 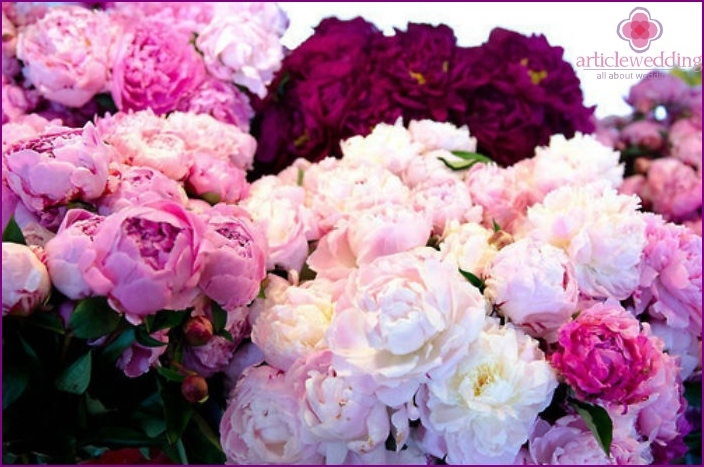 Few people know the origin and characterpeony value, and in fact to the choice of colors for the celebration is approached with great responsibility, familiarized with their value. According to history, the flower its name was in honor of the famous healer peons, who was involved in the treatment of the wounded in the war. For a long time in China, peonies were considered the preferred color, breed them could only deal with the emperor. Plants endowed with magical properties, able to protect the house from evil spirits. 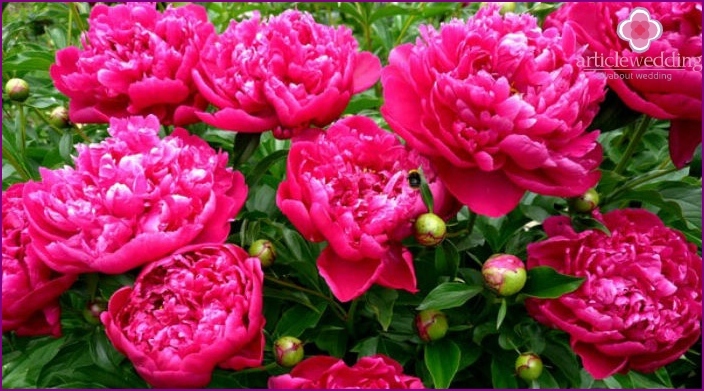 Peonies - a flower of the sun, wealth and prosperity for the Chinese treatises. For Japan, a bouquet with peonies symbolizefertility, untold riches. And in the countries of the Mediterranean - a flower of joy, a wonderful future, hope for good luck. 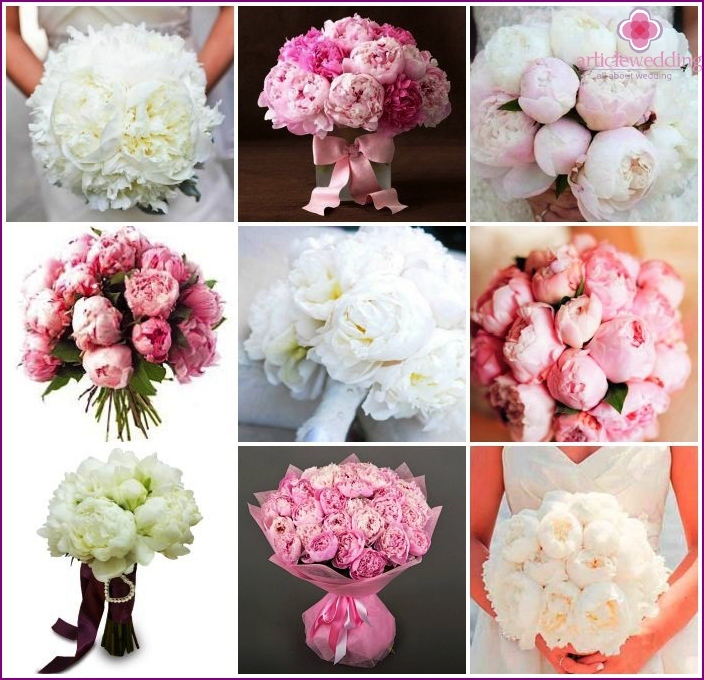 In Russia, the bride's bouquet of peonies - a sign of a happy married life, strong relationships, family well-being. Today, such a composition - it is also a symbol of tenderness, sensuality, purity. White - symbolizes purity, innocence, sincerity of feelings. Pink - a symbol of material well-being, respect for the family. Red or maroon - represent passion, devotion, sensuality newlyweds. 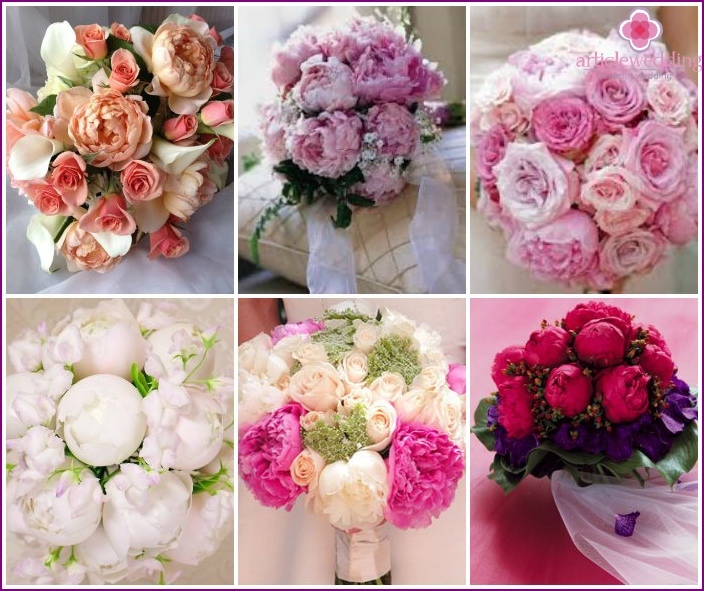 Select a bouquet for a wedding, which includedPeonies are not so simple, because the variety of shapes, colors amazing. 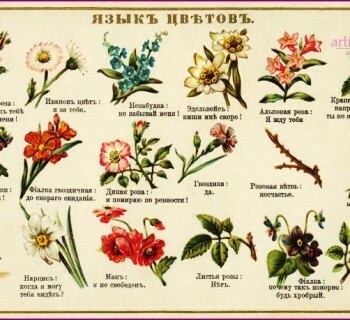 There are more than 5000 varieties of flowers with different leaf shape, size buds. Depending on the season, the flowers can be local or Dutch origin. In our part of the period of flowering peonies is in the middle of May - beginning of June, and the rest of the flowers in the Russian import. Dutch varieties is small in size buds and fewer colors. 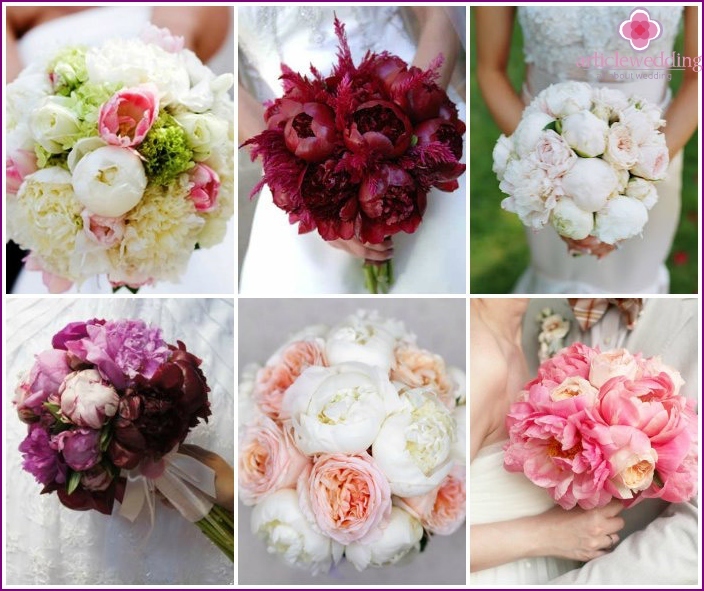 To create a bridal bouquet of peonies, should not besimply define the variety of colors, but also to solve many more important tasks. 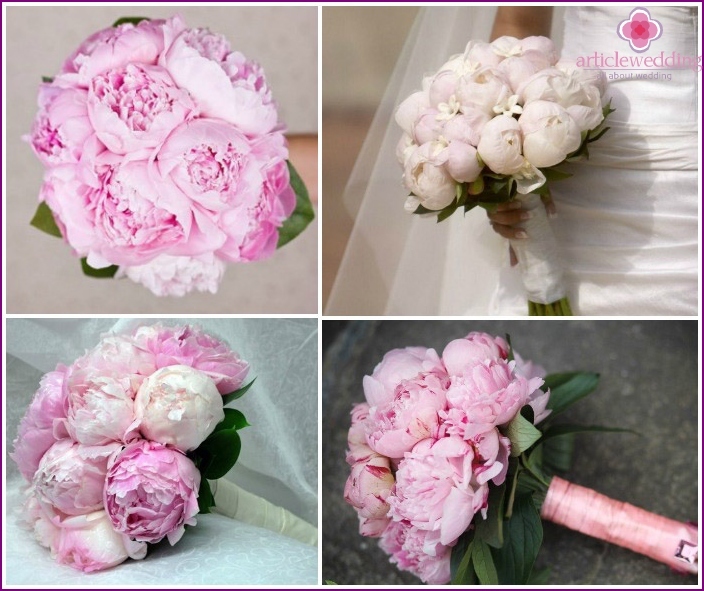 We must choose the form of a wedding bouquet, as well as additional accessories or items that will be used for its execution, and to understand - this will be one peonies or complement the other colors. In the shape of a ball. Perfect fit, delicate girl of medium height.? The classical form (Biedermeier). Typically, such a small bunch of rounded sizes and colors arranged therein in the form of rings. Gather such formulations on their own or in the stems portbuketnitse. This option is ideal undersized slim girls with a magnificent dress. The elongated form of the composition. For its creation, use flowers on long stems, or a special base - frame. This option is suitable for tall girls, and will be perfectly combined with a wedding dress straight cut. For tall girls with slim figure - suitable sloping shape, for its creation using flowers with long stems. Round form. 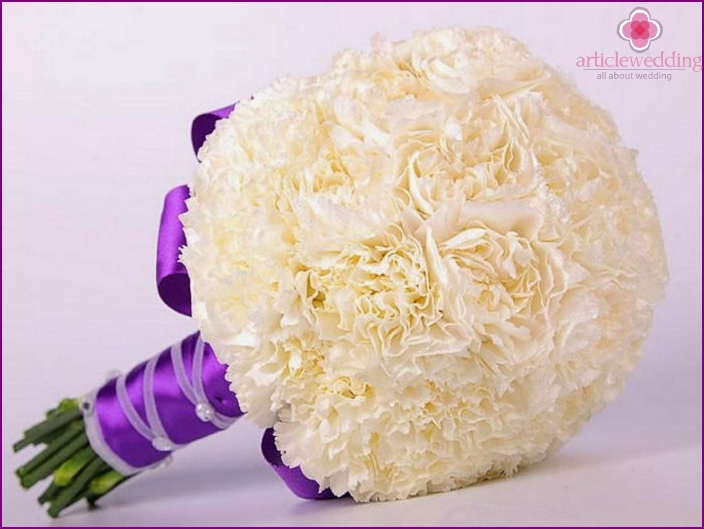 To create such an attribute of wedding flowers tightly attached to each other, forming a hemisphere. This form goes well with any style of dress suits and brides of any body, ie, virtually universal. Choosing a wedding attribute, you should payattention to its color, so it was in harmony combined with the bride's dress and the accessories. With snow-white dress will look great with a bouquet of pale pink or red peony, white as "lost" against the background of dress. 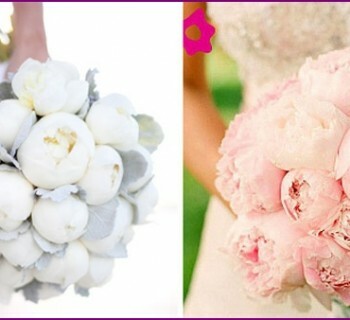 But for the ivory-colored dress, ivory or silver, golden hue - white flowers will look amazing. 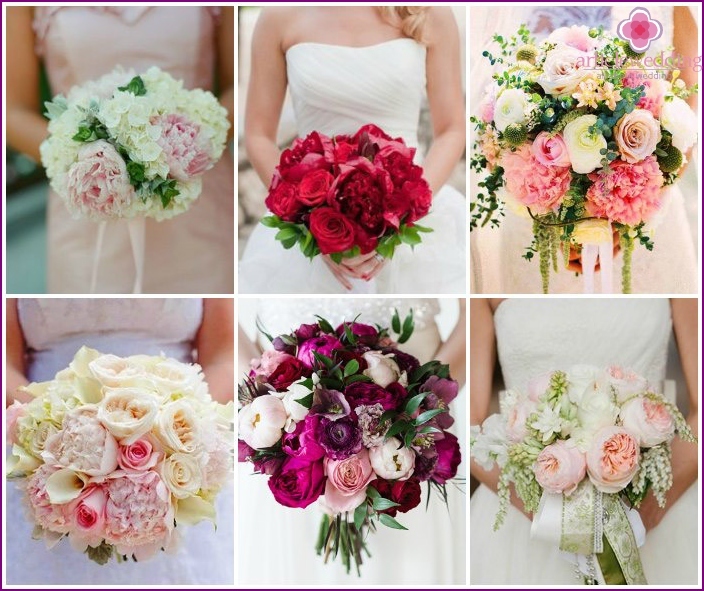 When choosing a flower attribute, the bride beforeall must be guided by their own wishes. This should be a bouquet, which she had dreamed of since childhood or draw in their fantasies from the time of betrothal. If the future wife is hampered with a choice and she have any doubts, you should consult a professional florist. Specialist help with the selection, dispel doubts and suggest how to better create the perfect composition for your holiday. 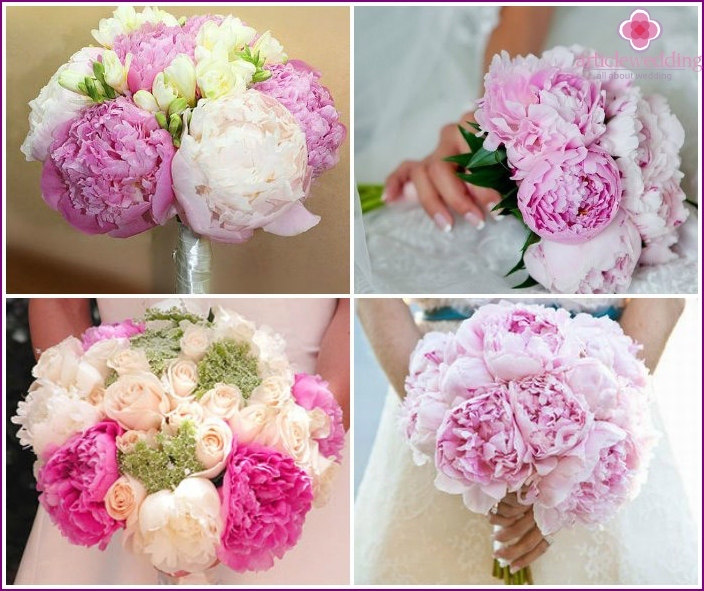 Peonies - Flowers are self-sufficient, so the weddingcomposition with them will look delightful. Especially if the florist wisely select colors, sizes, combining a full-blown head and originated only (barely opened) buds. 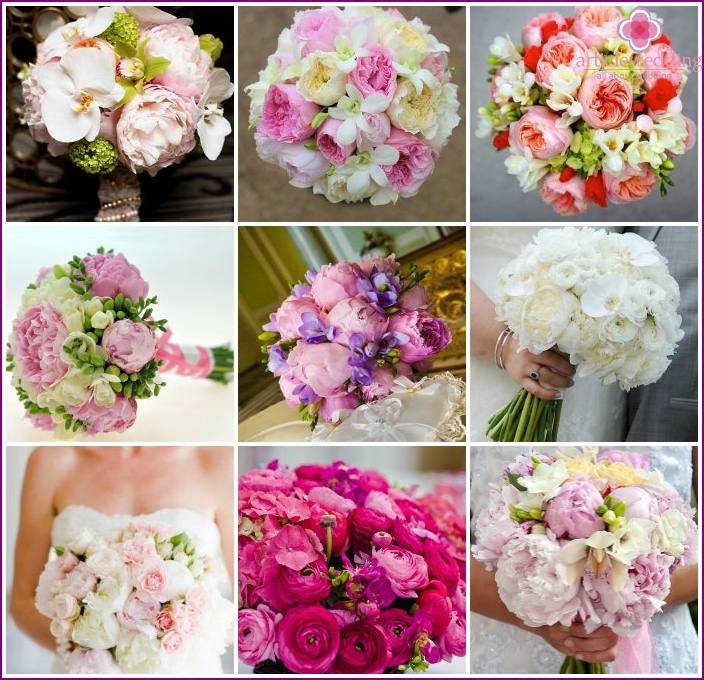 But often the bride's bouquet wish to dilute sprigs of greenery, decorative elements, or other colors. As a rule, they are used for this roses, poppies, orchids and freesia. Peonies and roses - two of the most beautiful flower,so they are often used in tandem to create and design a wedding bouquet. Magically looks combination of the two colors of the same colors, they complement each other, creating a total tandem. To create contrast and give the composition a special highlight, often used roses on brighter tone, but only so that they do not overshadow the beauty of the main colors. This bouquet will look perfect as small rosettes on the branches, and large, blooming buds. Gently and sophisticated look in hands of the bridebouquet, which included only are peonies. To create the flower arrangements of this kind are used are white or pale pink flowers of different varieties. The ideal form - a hemisphere, sphere, or classic. Elegance, charm, lightness and simplicity make this bouquet of many admiringly look at it, chaining all the guests' attention to the bride. As a decoration may use satin ribbons, beads or brooch. For girls who want to make the unusualwedding song, in addition to pions, should add flowers such as orchids and freesia. 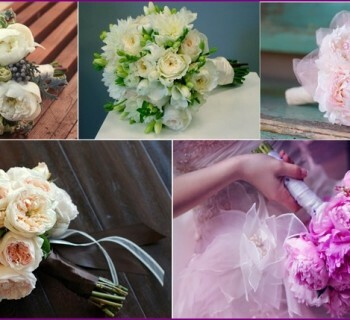 They are able to add a bouquet of elegance, make it look more sophisticated. Also nice would look like wedding composition, where unite harmoniously and peonies rankulyusy (they vaguely resemble peonies). This combination is ideal because colors complement each other, creating a beautiful tandem.